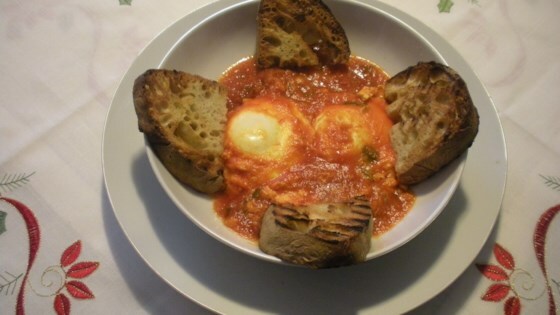 "This traditional Italian recipe of eggs cooked in a rich homemade tomato sauce with olives, capers, and anchovy makes a very tasty breakfast or brunch. Serve with toast." Heat oil in a skillet over low heat. Add garlic, olives, capers, and anchovy; cook for 1-2 minutes. Add tomato passata and water, bring to a boil, and simmer until flavors combine, about 10 minutes. Add parsley and season with salt. Gently add eggs directly into tomato sauce without breaking the yolks. Cook until eggs are just cooked, 3 to 5 minutes. Canned tomatoes pack the healthy antioxidant lycopene in this hearty dish!